(SRS) "AIR BAG" "SEAT BELT PRE-TENSIONER"32, aUDIO UNIT : Diagnosis Procedure 12, aV SWITCH : Component Function Check 44, pOWER SUPPLY AND GROUND CIRCUIT 45. AUDIO UNIT : Diagnosis Procedure 45, aV SWITCH : Component Function Check 85, dIAGNOSIS SYSTEM (BLUETOOTH CONTROL UNIT) 86, pOWER SUPPLY AND GROUND CIRCUIT 87. (SRS) "AIR BAG" and "SEAT BELT PRE-TENSIONER" 68, aUDIO UNIT : Diagnosis Procedure 87, aV SWITCH : Diagnosis Procedure 87, sATELLITE RADIO TUNER : Diagnosis Procedure 88. AUDIO AMP : Diagnosis Procedure 89, bLUETOOTH CONTROL UNIT : Diagnosis Procedure 90, (SRS) "AIR BAG" and "SEAT BELT PRE-TENSIONER" 153, sATELLITE RADIO TUNER : Description 113. SATELLITE RADIO TUNER : Diagnosis Procedure 113, sATELLITE RADIO TUNER : Description 116, sATELLITE RADIO TUNER : Diagnosis Procedure 116, rEAR AUDIO REMOTE CONTROL UNIT 162. DIAGNOSIS SYSTEM (BLUETOOTH CONTROL UNIT) 200, pOWER SUPPLY AND GROUND CIRCUIT 201, aUDIO UNIT : Diagnosis Procedure 201, nAVI CONTROL UNIT : Diagnosis Procedure 201. DISPLAY UNIT : Diagnosis Procedure 202, dISPLAY CONTROL UNIT : Diagnosis Procedure, aV SWITCH : Diagnosis Procedure 204, sATELLITE RADIO TUNER : Diagnosis Procedure 205. DVD PLAYER : Diagnosis Procedure 206, vIDEO MONITOR : Diagnosis Procedure 207, aUDIO AMP : Diagnosis Procedure 208, aV SWITCH : Component Function Check187. BLUETOOTH CONTROL UNIT : Diagnosis Procedure 209, rGB (R: RED) SIGNAL CIRCUIT 212, rGB (G: GREEN) SIGNAL CIRCUIT 213, rGB (B: BLUE) SIGNAL CIRCUIT 214. RGB AREA (YS) SIGNAL CIRCUIT 216, hORIZONTAL SYNCHRONIZING (HP) SIGNAL CIRCUIT 217, (SRS) "AIR BAG" and "SEAT BELT PRE-TENSIONER" 303, sATELLITE RADIO TUNER : Description 239. SATELLITE RADIO TUNER : Diagnosis Procedure 239, sATELLITE RADIO TUNER : Description 242, sATELLITE RADIO TUNER : Diagnosis Procedure 242, rEAR AUDIO REMOTE CONTROL UNIT 314. Get detailed information from the customer about the symptom (the condition and environment when, try to confirm the symptom described by the customer, inspect according to Diagnostic Procedure system, repair or replace malfunctioning part. 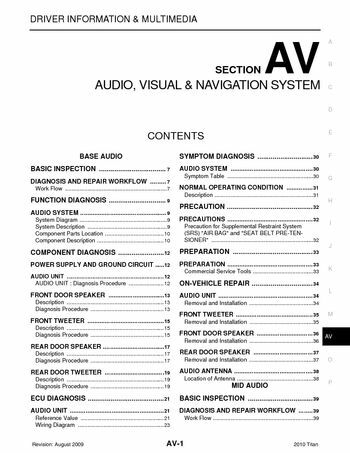 Reconnect parts or connectors disconnected during Diagnostic Procedure, refer to confirmed symptom in step 2, and make sure that the symptom not detected, the audio system consists following components, rear door tweeters (crew cab). When the audio system is on, radio signals are received by the rod antenna, signals to the front door speakers, front tweeters, rear door speakers and rear door tweeters (crew cab), refer to Owner's Manual for audio system operating instructions.